On a good day, the drive from Naperville to Court Theatre in Hyde Park takes an hour each way. But for several years, the Weils and Koveners have braved the traffic to see Court’s productions together. Gary and Sharon Kovener quickly became regular Court patrons after attending a Producers’ Circle event. 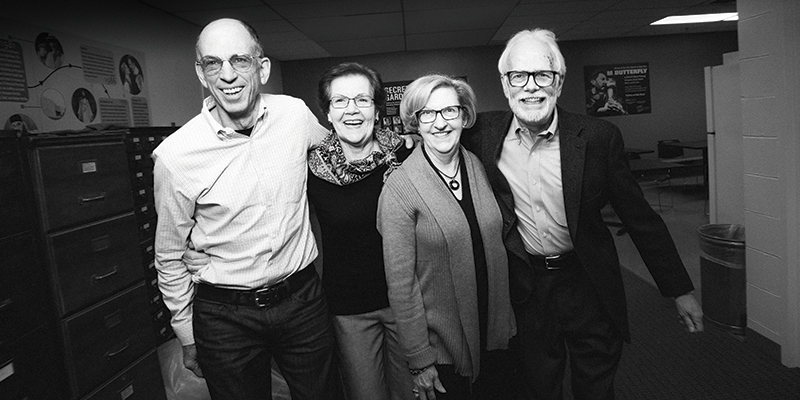 Beyond the challenging, emotional work that is produced onstage, Gary and Sharon also appreciate Court’s engagement with the community, the University of Chicago, and the audience. With so many years of Court Theatre to consider, the couples have many favorite moments and productions. Tom and Barbara particularly enjoyed Man in the Ring (2016) and The Year of Magical Thinking (2010). For Gary and Sharon, two behind-the-scenes moments that stand out are discovering the intricate set design in Blues for an Alabama Sky (2017) and exploring the themes of justice and vengeance in Electra (2016). The Producers’ Circle is the premier giving society that provides you with exclusive access to the creative artists and inspiring scholars involved in Court productions. To learn more about the Producers’ Circle and become a member, contact Lauren Sheely, Development Assistant, at (773) 834-3563 or via email.